At 1/8 in. 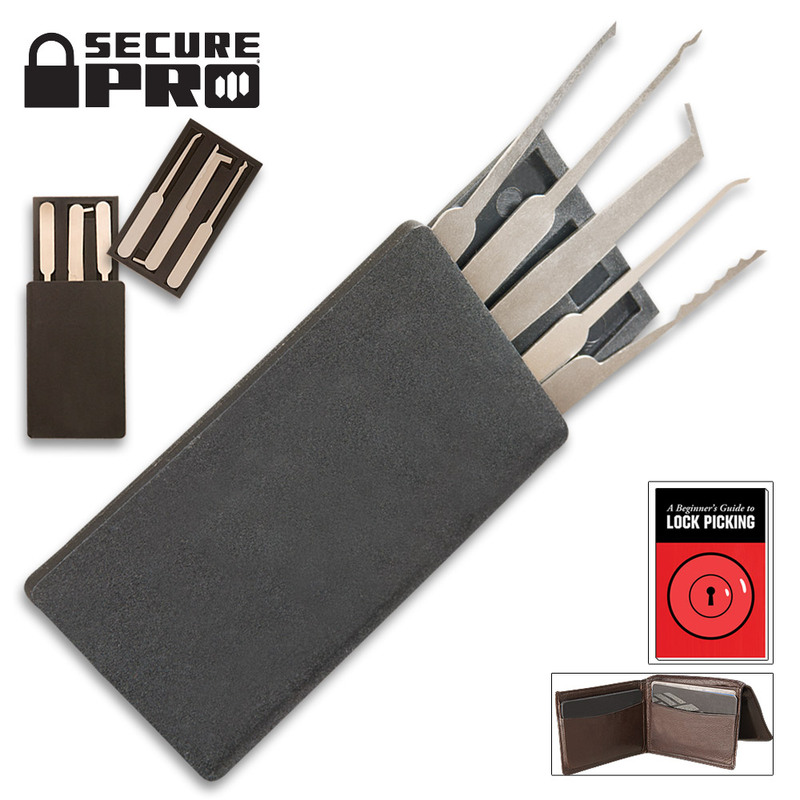 thick, this functional, near credit card sized lock pick set is ideal for wallet or pocket carry! The back slides off to reveal 4 individual picks and a double-sided tension tool. The picks are solid stamped stainless steel and will give you hundreds of uses. This set fits in your wallet perfectly so that you can have it with you wherever you go. 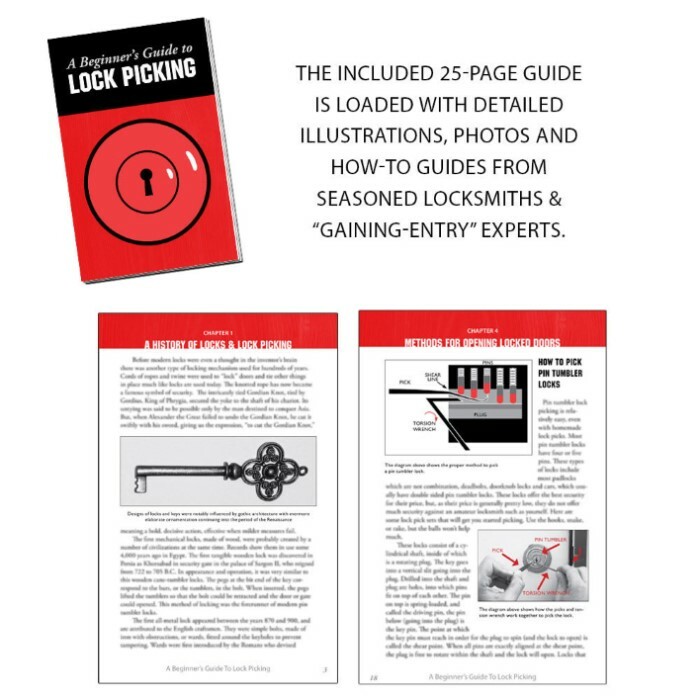 Also includes The Guide to Lock Picking book. So in my youth I use to be a Magician, Now much older and a father of 4 I find myslef looking for new activities to connect with my children. One year as a gift a friend bought me this set to see if I had any Magic'esk skills in my old age..after fooling around with the kit for about 15 min. my 8yr old son walks over and asks if he can try to open a lock..long story short kid opened the lock in under 5 min. now he's under 1 min., it was and continues to be a great gift and activity to get the dexterity moving and spend. Great tool. First ever shot I unlocked my house (schlage) in about 35 seconds. Second time took me 5 minutes. It's about feel and technique. I have unlocked BEST deadbolt 7 pin from store front when our reception desk was delivered and owner wasn't there with key to unlock side door (only way it would fit and had permission) As for them being flimsy, the tensioner is for tension only. You will bend if you don't know what you are doing. I am a commercial finish carpenter who does a lot of door hardware and will stock up when it goes on sale (bogo). Very good set for beginners. Extremely difficult to pick locks with security pins, and damn near impossible for locks with double sided tumblers (both of which are used in most locks on houses, businesses, etc.). This set can open smaller things, such as small safe locks, cabinet locks, and big padlocks. Used it to teach my girlfriend the basics. If you're SOL and locked out of somewhere, you're probably going to need a better set, but, like I said, it's good for learning basics. Great product and great price. If you know the basic concept of picking, this product is all you need. Fits easily into a wallet. Nice set for the price. Very useful! Although these aren't premium materials, this little wallet set is ultra handy and light. It is practical and worth the purchase. Grab yourself a couple today, you won't be sorry!!! Padlocks beware!!!!! Very nice set for the price. Easily kept in wallet with all needed to open most locks. Had my eye on this little set after some reading about lock picking as a Prepper skill. Jumped on it when it went on sale as a start for bigger and better things- like EZ decoder sticks and cracking Master lock combos! All in good fun, of course. While it is discrete, the metal is quite flimsy and does not provide an easy unlock. When i was useing it I felt like every single time I put pressure on it, it was going to break. Good for the price. Could be user error.